The Days of Johann, an agility dog! 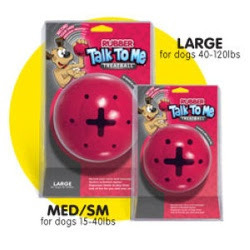 : Testing out the rubber Talk to Me Treat Ball! Testing out the rubber Talk to Me Treat Ball! The other day our good friends at SuppliesJust4Pets.com, one of the companies that provides some of the super cool Nina Ottosson Interactive and Intelligent Dog Toys on JohannTheDog.com, sent us another cool new toy, just out on the market - the new rubber version of the Talk to Me Treat Ball. It's pretty cool! When we first got it, Mum opened it up and recorded a little message for each of us, since one of the neat things the toy does is talk to you when you hit or bump it. The toy has a rubber outer coating, not super soft rubber, but makes it a little softer than the previous hard plastic version. But we liked it most as a great treat dispensing toy. We had a lot of fun with it. The other night Mum fed me my dinner in the toy. And I have to say there is no way I'm going to need austin weight loss if I eat my diner from this toy every night, BOL!!! I didn't hit it hard enough for the message to play, but Gracie did when she got active and playing with it. One of the things we liked about it is that I learned to use my nose! With most toys, I like to paw 'em, and with this toy I used my snout more to move the ball. Mum loved that I finally figured out I have a snout that can be used for more than just smellin', BOL!!! Love Johann's ear hair!!! Too cute. Both him and Gracie look so happy! So, does the ball only make noises when it's up against a wall? I saw his hair in the video, and thought, where did that come from!! It's actually his mane fur, but all around it he blew his coat, so in the summer he looks funny. Will be glad to see his mane fill in this winter again :) Too funny! Actuallly the ball should talk when the dog paws it. Friend of mine has one for her cat and it goes off probably more than she would like, BOL!!! I think we got one that's not as sensitive, which is a good thing for us :) But we still love the treat dispensing qualities.